The Tap2Tag Wristband gives you access to your complete medical profile in a waterproof, heat-resistant silicone band. 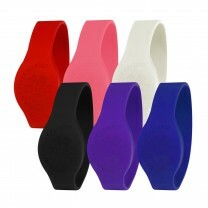 The chip which connects your wristband to your profile is also encased in silicone. Your profile can include a picture, your past and current medications, a comprehensive list of your allergies and conditions, contact information, your doctor’s number and address, scanned medical documents, and much more. Update your profile any time with no subscription required.